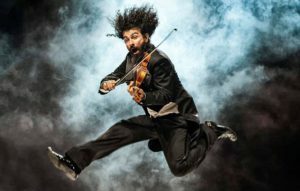 On May 27, 2018 the Svetlanov Hall of the Moscow International House of Music will host the only concert of the Armenian violinist-virtuoso from Spain Ara Malikian within the framework of the world tour “The Incredible Journey of the Violin”. Ara Malikian in the company of the professional musicians will perform classical world masterpieces by Vivaldi, Mozart, Paganini and other great composers, the fateful compositions of Led Zeppelin, Jimmy Hendrix, and David Bowie in the original interpretation, as well as his own works. The Russian public will be able to enjoy not just an instrumental concert, but become participant of a real show with bright costumes and dances. Malikian’s concerts are the break of template, the absence of boundaries and frames, live emotions and humor in combination with the unique technique of playing the violin, which cannot leave indifferent even the most experienced spectator. Ara Malikian is the winner of numerous prestigious awards and awards, the nominee for the Latin Grammy Awards, in the past – the first violin in the orchestra of the Royal Madrid Theater. He distinguishes among other musicians by the masterful and unique performance of both classical music and author’s compositions reflecting the culture of the Middle East, Central Europe, Argentina and Spain. Ara gives about 300 concerts a year around the world. He has had more than 100 performances with prestigious orchestras, including the symphony orchestras of Tokyo, Bamberg, Madrid, Portugal, chamber orchestras of Zurich, London, the Philharmonic Orchestra of Armenia, the “Virtuosos of Moscow” and many others. His music was performed in more than 40 countries around the world at the most famous venues. The musician is also well-known by his work in big cinema. Malikian is the author of the soundtracks to “Talk to Her” and “Bad Education” – the two movies of the Oscar-winning director and screenwriter Pedro Almodovar. The artist also worked with other movie directors. So, in 2016 he wrote a soundtrack for “Promise” – the sensational film of Terri George, which tells about the Armenian Genocide of 1915. The Moscow audience is already familiar with the works of Ara Malikian thanks to his humorous quartet “PaGAGnini”, the performance of which was a resounding success in 2016. The musician himself believes that the most difficult in playing the violin is to evoke emotions among listeners. “It’s very difficult to achieve an ideal performance, but, to my opinion, the public does not need perfection, but rather needs you to speak to its heat and to elicit emotions, and that is achieved not by technical proficiency, but by heart and by soul”, – affirms Ara Malikian.